I managed to finish all the grading early afternoon yesterday and got to spend the evening watching Doctor Who with Jack and Lucy, before an early night. I got all the grades posted onto the system by lunchtime today. I’ve gone through all my notifications and my inbox is zero. I think I’m getting the hang of the commenting thing. Sometimes I still feel a bit awkward and over-think what I’m saying but I suspect this is mostly going to be an experience/practice thing and it’ll get easier the more I do it. That’s what I’m hoping at least. Now all I have to do is catch up on my reading page. Wish me luck? I would have liked a breakdown of the genres and authors that I read the most as well – does anyone who uses Goodreads know if I can find this information at all? Synopsis When Alex Munro learns that the love of her life is getting married to another girl, all she wants is to be alone – and as far away from Edinburgh as possible. Moving to a Cornish cottage, which comes complete with the world’s scruffiest dog, Alex finds that her new neighbours are determined to involve her in their madcap Christmas festivities. Just for Christmas has the perfect winter cover. I am a bit of a magpie and anything that glitters grabs my attention and makes me go ‘oooooooh!’, so the twinkly cover appealed to me from the get-go. 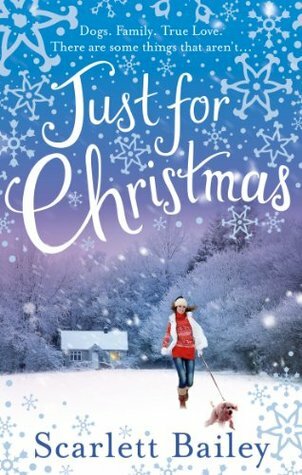 I’m also a sucker for books about Christmas, chick-lit and animals, and Alex, the protagonist in Just for Christmas finds herself lumbered with a mad, scruffy dog called Buoy. I warmed to both characters immediately; they are both vibrant, full of personality and desperately in need of love. In fact the characters are the biggest success in this story. I felt like I knew them all, from Ruan, the slightly aloof boatman to Lucy, the barmaid with a hidden past, and I cared for them too. Village life in Cornwall was also beautifully portrayed. Images of warm, bustling pubs where everyone knows everyone else, a strong community spirit and the importance of festive traditions being upheld made me want to be resident in Poldore myself. There were elements of the plot that moved unrealistically fast, but I really didn’t mind that at all-sometimes life does move crazily fast and situations change overnight, and even if they didn’t I wouldn’t care because one of the great benefits of fiction is that anything goes! If you have enjoyed Scarlett Bailey’s other books, or are a fan of Amy Silver, Sophie Kinsella or Marian Keyes, I am sure you’ll love this heart-warming story. As well as Christmas fun and froth it touches on the importance of family, friendship, acceptance and community-something we all need more of at Christmas. Lucy and I went to a ‘legs, bums & tums’ fitness class this morning, lots of lunges, step and squats. The instructor, also called Lucy, promised us our bodies would thank us for this workout. My body is not currently thanking me. My thighs, in fact, are protesting quite severely about it. After all that vigorous exercise, we then had a much calmer afternoon. I made another batch of chocolate raspberry brownies (last week’s went down very well and more were requested) and we needed to replace the calories we burned off! We cuddled up on the couch with Jack, who has actually behaved all week and properly rested his back and knees, and ate them while they were still warm and gooey, playing Cards Against Humanity and Exploding Kittens until my sides hurt from laughing, before we watched some Buffy. by Adam Becker… is it too late to ask Santa? This evening has roast beef in store, as well as Doctor Who. Other than that, I’m thinking a soak in a hot bubble bath to ease my aching legs with my book (currently reading Just For Christmas by Scarlett Bailey) and some music, possibly followed by an early night.